Illinois Wesleyan is a hands-on university at which students should expect to delve into research and collaboration with faculty members starting their first year. When I visited, professors from several different departments and administrators spoke to my counselor group about a level of interaction and mentorship that most colleges can’t provide. STEM (science, technology, engineering and math) students, for example, have small introductory classes and immediate opportunities to participate in conducting and presenting research. “Illinois Wesleyan encourages you to demand excellence in yourself,” said Lexi (the blonde sitting to Alex’s right in the video above), a senior political science and English major who will be attending Notre Dame Law School, and who played on a national championship basketball team. While she had the opportunity to choose a Division I school, she was happy with her decision to focus on academics while still competing in her sport at the Division III level. Basketball, soccer and baseball players also enjoy lots of student support. The recently-built and soon-to-be-expanded Shirk Athletic Center is funded by the local Shirk family, which owns the company that makes Beer Nuts (I left campus with a gift of Beer Nuts!). So why would a student who has straight As, 4s and 5s on multiple AP tests and super-high test scores come to a small, liberal arts college like Illinois Wesleyan? 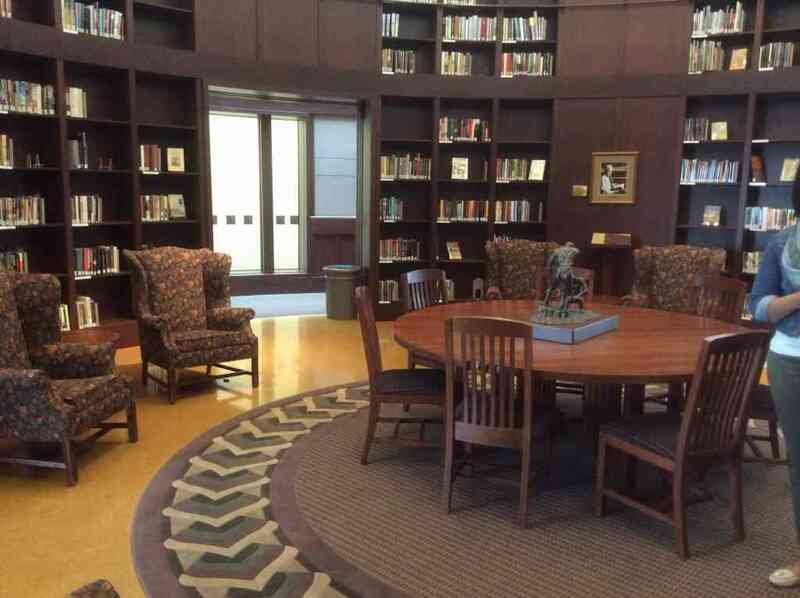 Comfortable spaces within the Ames Library facilitate group study at Illinois Wesleyan. 2. Nearly every single student is offered some type of financial aid – and merit aid for the stronger students is very generous. Financial aid is a high priority for this school, and while they don’t promise to fill 100% of your financial need, they will work with you to find a way to make it affordable for you to attend. 3. While it is a liberal arts college, the business, nursing and performing arts (music and theatre) programs, all grounded in the broad liberal arts base education, are very strong. There is also a very strong 3-2 engineering program in which students can major in Physics and then transfer to earn an engineering degree. 4. The four-year graduation rate is 78-80%; 95-96% of students who graduate do so in four years. 6. This is very cool – Illinois Wesleyan hosts this online digital clearinghouse of all student research projects. Explore them here! While most large universities tell students to look to their left and right at freshman orientation and tell them that only one of the three will graduate with a math or science major, IWU professors work closely with STEM students to prevent what Professor Gabe Spalding calls”the leaky pipeline” of students who drop out of these challenging disciplines. I had a very positive feeling during my visit to Illinois Wesleyan and would recommend it to any student interested in getting away from home and studying in a liberal arts environment. Admissions stats: SAT mid-50% Critical Reading: 540-670, Math 590-740. Average GPA is 3.8. Audition-based theatre and music programs and direct-entry nursing. You can see all of my photos from my trip to Illinois Wesleyan here.